The Big Short got a big lift Saturday night from the PGA in the three-way race for the Best Picture Oscar with The Revenant and Spotlight. In fact, when producers Dede Gardner and Jeremy Kleiner accepted the coveted Darryl F. Zanuck Award, Kleiner was so flabbergasted that he said he thought they were just being named as one of the nominees. The PGA win obviously represents a significant momentum shift for the Adam McKay black comedy about the financial collapse of 2008, given that 19 out of 26 Zanuck winners have gone on to win Best Picture. Plus, Gardner, Kleiner, and Brad Pitt also produced Oscar winner 12 Years a Slave, which shared the PGA award with Alfonso Cuaron’s Gravity, and went on to win Best Picture. 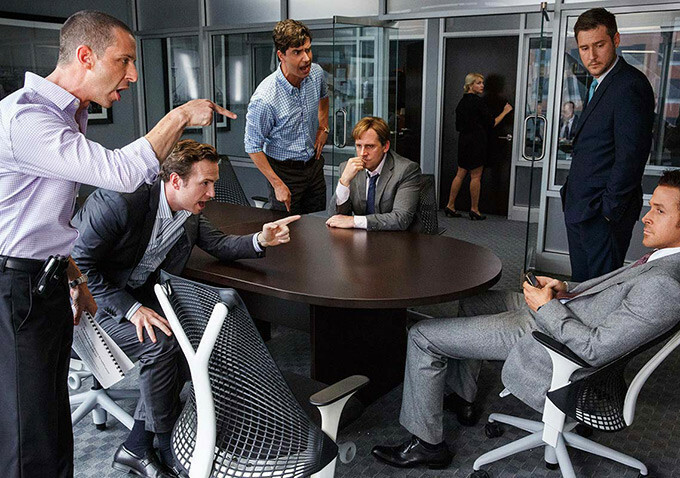 The win lends more gravitas to The Big Short, which, despite its darkly comedic tone, is topical, provocative, and — most important — extremely well-made. Of course, this is bad news for The Revenant, the Golden Globe (Drama) winner — which has been gaining momentum and just passed $100 million at the box office — and Spotlight, the early frontrunner and the consensus critical fave. Other PGA film winners Saturday night at the Century Plaza Hotel included Pixar’s animated Inside Out, produced by Jonas Rivera, and Amy, produced by James Gay-Rees, both Oscar frontrunners in their respective categories. Industrial Light & Magic earned the Visionary Vanguard Award, presented by J.J. Abrams and accepted by president Lynwen Brennan and chief creative officer John Knoll. “George [Lucas] had outrageous expectations for tools at the time [of Star Wars] and it drove innovation with healthy confidence,” Knoll told me afterward. Knoll has spearheaded a new infrastructure at ILM to handle not only the return of Star Wars but also outside projects with cutting edge directors. This tech includes an advanced simulation workflow and a “Unified Assets” program that allows the cross-platform sharing of modeling, texturing, and shading assets for a given franchise. Knoll, who pitched the idea of Rogue One as a TV episode and then as a standalone feature to Lucasfilm president Kathleen Kennedy, added that there’s a wonderful sharing of tech under the Disney umbrella, including Disney’s Medusa Performance Capture system for transforming Lupita Nyong’o's facial expressions into Maz, and Pixar’s RenderMan RIS rendering paradigm for ray tracing. But Knoll’s also extremely proud of ILM’s photoreal bear in The Revenant, a VFX Oscar contender along with The Force Awakens. He said it’s the complete opposite of Star Wars: two hours of invisible work.